Radreise & Fernradler Forum » Bicycle equipment » New generator ? #1368973 - 04.01.19 22:01 New generator ? … actually I was just jocking !!! … but now it appears that somebody took it pretty seriously and, simply, “did” it!! It's a rather open design, which might in practice create problems with dirt, corrosion etc. ... oh sure, of course it works !!! Can you explain in more detail, how it is supposed to work? I only see screws, some cable and an non-circular housing mounted around the rear axis. HERE how it works !! Oh, I see. Well, you listed a series of cons, so where is the benefit? Ok, perhaps the first post isn't clear enough !! 1. the 1st picture shows my own prototype that I did a few years ago. 2. the 2nd picture shows what a guy somewhere in the United States is trying to put into production through a crowdfunding scheme financing. The system is definitely working, the rotor is fitted with permanent magnets, the stator with coils wired in series to increase voltage. One of the possible advantages compared to hub dynamo is that you do not have to dissamble/assemble the wheel and it can work without introducing any additional mechanical friction !! Ok, but this seems to me a kind of solution for a no-problem. There are hub dynamos in very high quality available for almost all kind of bikes. Yes, probably you need to build a new wheel, but is this really so much more afford than buying and installing such an alternative (non StVO admissible) dynamo? If you really care that much about friction, you might also use one of the available detachable dynamo solutions. But basically I don't see, where e.g. a hub dynamo causes more friction than the crowdfunding soltuion? Both have the hub bearing as only mechanical source of friction, or do I miss an aspect? Did you measure the electrical power output? Do you have more information or a link about the guy in the USA with the similar generator? 1. Yes, mechanical friction is indeed exactly the same one valid for a standard hub dynamo, both so far use bearings. Thank you for the link to SPINETICS. But it's not clear there what's the actual status of the project. It seems they didn't succeed with their Kickstarter-campaign back in 2015. I do not just want to criticize. I really like all kind of new ideas about bike techniques. I am convinced that there are still opportunities with the dynamos if you drop the traditional StVO requirements. Three-phase-current might e.g. be a realy promising idea. I just wanted to know, where the possible benefit of this kind of dynamo is and apart from the easy installation on some (bikes using disc breeaks don't seem to be compatible), I don't see it. The new generator construction might deliver more power (at some speeds), it might be possible to adjust the distance between coils and magnets during the ride to increase power output in one situation and decrease losses in other situations. 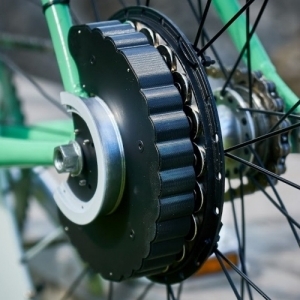 Just the possibility to make a powerful DIY bicycle dynamo is appealing to me. 3. Conversely, the generator presented above can modulate the power just adjusting the distance (airgap) between rotor and stator, or adding/removing magnets if you like!! Just one question: why to possibly conceive a new type generator we are necessarily supposed to adhere to StVZO standards? To the best of my knowledge the German and Dutch market ist the biggest in the world for cycle dynamos. It will be really hard for a company to establish a product which may not be sold in these markets. However, with the last changes in the German StVZO all the old-fashioned requirements with 6V/3W have been droped. It only says, that the whole light installation should be "sufficient". The "OK" of the KBA (Kraftfahrtbundesamt, the agency certifying cycle light products) is still necessary, but if a company builds a complete system (dynamo+light), it has a good chance to get the permission. The problem is, if you leave the 6V/3W-specification, the you neither get access to the dynamo market, not to the lights market - it will be very hard to make buisness with a complete system. As far as I can see the StVZO 6V/3W basic specification has been established and then enforced in the years to guarantee sufficient light using a traditional 6V/3W (12 Ohm) filament incandescent light (or its electrical equivalent represented by a 2.4W-15 Ohm front light in parallel with a 0.6W-60 Ohm rear light). But today even halogen lamps have been replaced by more modern and more efficient LED lights capable indeed to deliver more lumen/lux per watt, and that’s why nowadays on the market do exist 1.5 W StVZO hub dynamos. But today, IMO, dynamos are becoming pretty much used not only for lightening but also for charging usb devices … and in this case 3W might not be enough!!! To produce more powerful dynamos involves of course technical implications such as weight, dragging and quite possibly also output voltage, to the point that some safety hazard issue might arise. So what’s the real reason for not producing dynamos capable to deliver more than 3W ? I think it is just a question about the size of the market. I guess you know the price for the special size dynamos like SONs/Shutters full-floating axle dynamos for modern MTBs oder one-side-attached dyamos for trikes? And these markets are presumeable larger than the market for high-power-dynamos. And it's not only the dynamo, but also the electronics for a current/voltage regulation, a buffer battery and a solution how to attach (standard?) front/rear light. I guess that such a complete system costs 500€ or more. And there won't be many people willing to pay that. And you should also take into account, that more and more bikes come with a huge battery which makes a dynamo obsolete. From my minimalistic point of view, the better way would be to go for less consuming electronic devices, insted of increasing the power needs. ... from my minimalistic point of view, the better way would be to go for less consuming electronic devices, insted of increasing the power needs. Well, I basically agree with you. Nevertheless sometimes, only sometimes, I'd like to have a bit more than 3W ... let's say just 5W !! If I remember correct, 5-10Watt could already be harvested from a normal hub dynamo with the help of Forumslader, E-Werk or similar devices. The only problem: You have to ride at least 20-30km/h with 26"/29" wheels. If someone would invent a bicycle generator which allows to get 5Watt at a USB port at 10 km/h or below (of course this should be a light, efficient, long lasting, quiet and not too expencive device ) - this might be interesting. A nominal 6V/3W hub dynamo is "literally" to be intended as a dynamo capable to deliver 3W when connected on a 12 Ohm load, mounted on a 28" wheel running at 20 km/h. The same dynamo is nevertheless normally capable to deliver twice the a/m nominal power at 20 km/h, i.e. 6W, if connected to a suitable load around 30 to 40 Ohm. At this point the problem seems to be the AC/DC converter. The whole e-werk family can't get more than 2.75W approx output at 20 km/h. Forumslader, conversely, seems capable to do better, the only way to check if it's true is to have one and make real measurements.